Welcome to the Boynton Pet Clinic! We are an all woman owned and operated, full-service veterinarian hospital serving Boynton, Florida, and surrounding areas. We offer high-quality medical care and compassion to all of our patients, while offering understanding and education to their owners. 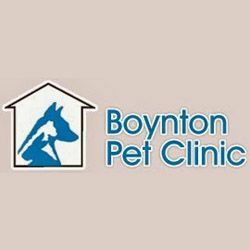 At Boynton Pet Clinic we offer a wide array of services for your pet’s overall health and well-being, ranging from radio surgery to geriatric medicine, and orthopedic surgery to dentistry. We believe that if owners are well informed about the best care for their pets, there will be less chance of disease, infection and overall health problems in the long run. Contact us today to schedule an appointment or to ask us any questions you may have regarding our practice, as well as the services we offer. Amenities: Boynton Pet Clinic is a full-service veterinary hospital. We perform medical, surgical, radio surgery and dental procedures, including non-anesthetic dentals. We do all of this with an emphasis on keeping your animal healthy to protect both the animal and owners from contagious diseases. Specialists are available to come in-house or when not available, referrals are made as needed. We also provide boarding and grooming services. The clinic first opened in 1990. Dr. Lucy subsequently purchased the clinic from the former owners in September of 1992. We are an all woman owned and operated practice. Dr. Lucy Cruishank graduated with honors from the University of Florida and has lived in the Palm Beach area ever since. She has been in practice since 1981. Currently residing in Boynton, almost everybody around knows her as “the lady who walks all those dogs”. Kathy is our receptionist. Kathy has been with Dr. Lucy and the practice since 1992 and is also certified in dental hygiene. Tracey is our technician. She has 11 years of combined experience with six of those with us. Last but definitely not least is IV, the hospital cat and personal greeter. Products: At Boynton Pet Clinic we accept dogs, cats, hamster, guinea pigs, ferrets, rats and other pocket pets. We do not accept exotics or large animals. Our most requested services are surgeries, dentistry and annual exams. Brands: Frontline Plus, Revolution, Frontline Spray, Advantage, Comfortis, Heartguard, Sentinel, Hills Prescription diets, Purina Prescription diets and Royal Canine limited antigen diets.